Nancy Pau (US Fish and Wildlife Service), Alyssa Novak (Boston University), Wayne Castonguay (Ipswich River Watershed Alliance), Peter Phippen (Merrimack Valley Planning Commission), Chris Hilke (National Wildlife Federation), Julia Knisel (MA Coastal Zone Management), Gregg Moore (UNH) and Darryl Forgione (MA Department of Conservation and Recreation) at the awards ceremony. John Aber and Gregg Moore of the University of New Hampshire College of Life Sciences and Agriculture received honors at the Environmental Protection Agency’s Environmental Merit Awards ceremony May 3 in Boston. The awards, which have been given out annually since 1970, recognize outstanding environmental advocates who have made significant contributions toward preserving and protecting New England's public health and natural resources, either within the past year or during a lifetime. 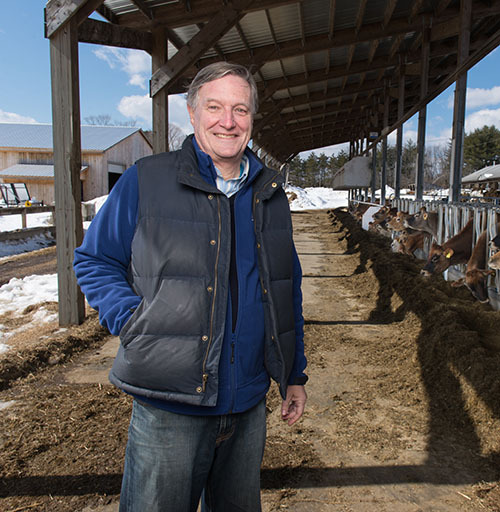 Aber, a professor of natural resources at UNH and a New Hampshire Agricultural Experiment Station (NHAES) researcher, was honored with the EPA’s Lifetime Award. He has studied the effects of acid rain on forest ecosystems since the 1970s and developed computer models that make it possible to understand the broader implications of its impacts. His focus has been the northeastern United States, but he has also conducted research throughout the eastern U.S. and in Ireland. John Aber at the UNH Organic Dairy Farm. Aber received the EPA's EPA’s Lifetime Award earlier this month. Aber is currently working on sustainable agroecosystem management at UNH’s Organic Dairy Research Farm. He's studying the use of composting to generate heat energy and reduce the farm’s environmental footprint. The research is funded by the NHAES. Moore, a research associate professor at UNH and an academic coordinator for the Shoals Marine Laboratory, is part of the award-winning project aimed at increasing the coastal resiliency of Massachusetts’ North Shore and protecting the Great Marsh, the largest barrier island and saltmarsh complex in New England. The National Wildlife Federation accepted the EPA merit award on behalf of the team, which includes UNH, the Ipswich River Watershed Association, the Merrimack Valley Planning Association, Boston University, the Massachusetts Department of Conservation and Recreation and the Massachusetts Audubon Society. Moore’s role is habitat restoration and community engagement across the coastal communities of Newbury, Newburyport and Salisbury, Massachusetts. The entire project, called “Community Risk Reduction Through Comprehensive Coastal Resiliency Enhancement for the Upper North Shore, Massachusetts,” is funded by a $2.9 million grant from the U.S. Department of the Interior.